Looking For Premium Bootstrap Admin Templates ?? Look no further, ThemeSelection provids Selected high quality, modern design, professional and easy-to-use Free Bootstrap Admin Dashboard Template, HTML Themes and UI Kits to create your applications faster!. If you are looking for more free templates like Chameleon Admin Lite, please visit ThemeSelection. It is not mandatory to use Node & Gulp as mentioned below for using this admin template, We have used Node & Gulp to compile SCSS file to CSS and generate minified dist CSS & JS file only. Download from Download from ThemeSelection and download the latest release. To install node packages, navigate to the template root directory, make sure to rename default package.json file to package.grunt.json and rename package.gulp.json file to package.json file. Then run npm install. NPM use the package.json file and automatically install the required local dependencies listed in it. When you contribute, you agree to give a non-exclusive license to ThemeSelection to use that contribution in any context as we (ThemeSelection) see appropriate. For the most recent change log, visit the releases page or the changelog file. We will add a detailed release notes to each new release. 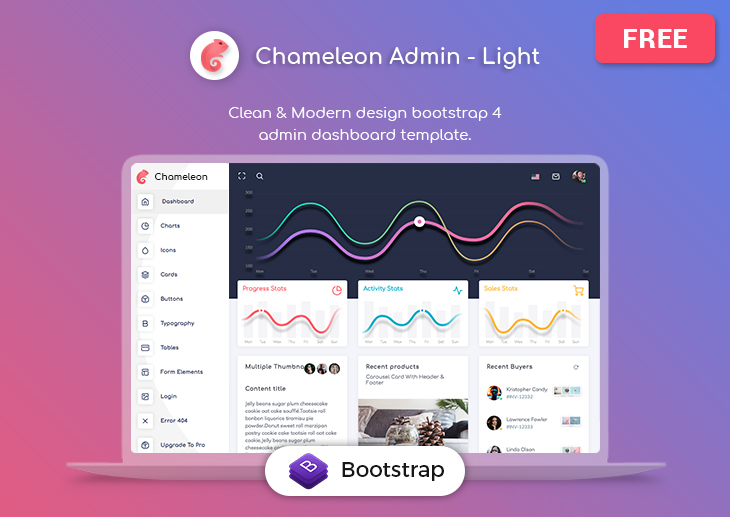 Chameleon Free Bootstrap Admin Template is an open source project by ThemeSelection that is licensed under MIT. ThemeSelection reserves the right to change the license of future releases.